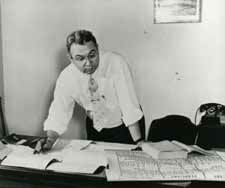 Harry Simmons was Major League Baseball’s schedule-maker for 20 years, a pioneer in schedule making before the age of computers. He was MLB’s first official historian and recognized as The Authority on rules of the game. A prominent historian and writer, Simmons authored the weekly Saturday Evening Post feature: “So You think You Know Baseball”, from 1949 to 1961. The column was later published in the Baseball Digest Magazine, and is the title of Simmons’ best-selling book. For many years he authored the baseball entry in the Encyclopedia Britannica, and he also did much of the original research on 19th Century baseball. Simmons was an executive of the International Baseball League (IBL) from 1946 to 1966, first in New York then in Montreal (1953-59). He then moved to the MLB Commissioners’ office until his 1982 retirement. Simmons not only developed the playing schedules for the Major Leagues, but various minor leagues as well. At the 1979 MLB winter meetings in Toronto, he was honored as “King of Baseball”; and in 1990, was recipient of the SABR (Society for American Baseball Research Salute in recognition of his contributions to the game. Simmons was elected to the Canadian Baseball Hall of Fame in 2002.